In the video, a preposterously cute grey squirrel monkey named Dalton bonks his head against a computer screen in front of him. Wide-eyed and muttonchopped, Dalton has quite the set up—the screen, wide in squirrel-monkey terms, displays dots of varying sizes and colors. Below that is a monkey-sized basin, like a sink in a dollhouse kitchen remodeled with stainless steel fixtures. Dalton is doing science. Male squirrel monkeys don’t see color well; they have a kind of red-green colorblindness. Dalton’s eyes really only see medium and short wavelengths of light—blues and greens, and their overlap color, yellow. He’s what vision scientists call a protanope. With no receptor for reddish hues, he see’s reds as dark yellows and yellow-browns, and greens as mostly yellow—to the extent that human color words mean anything to a monkey. “It’s more like, ‘what the hell?’” Neitz says. “Sometimes they’ll grab ahold of the tray. It’s a frustration thing.” In clip after clip, shades of red scattered amid greys go unseen, unlicked. The buzzer buzzes, the grape juice does not appear. Dalton’s body assumes the posture of a primate who would very much like to speak to a manager, please. Then there’s a discontinuity, a weeks-later time jump. Off screen—this was in 2009—Dalton undergoes a delicate operation. A surgeon inserts a long needle into Dalton’s eye, all the way to the receptor-dense, light-sensing retina at the back. With this microliter syringe, the surgeon injects a tiny bleb of fluid. “It creates a retinal detachment that looks like a blister,” Neitz says. The surgeon does this in three places, each 120 degrees from the others, in both eyes. In the fluid is a virus, specifically an “adenovirus,” a common variety of pathogen that includes the common cold. This one has been scraped clean of the things that make it germy, repurposed to carry a carefully designed stretch of DNA wrapped inside a ball of protein. A lot has to go right. The virus has to stick to the cell and evade the monkey’s immune system. It has to get the new gene into the cell’s nucleus and integrate into the existing DNA. The gene has to actually get turned on and start making proteins. It rarely goes right. “We’ve been working on ways to improve the efficiency,” Neitz says. At the highest viral titer, just 30 percent of cells infected actually turn on the gene. But those that do will go on to express not just one photopigment, but two. A once-middle-wavelength cone will also have a long-wavelength receptor. Nominally, it’ll see red, and Dalton will have a monkey superpower. Now Neitz cues up a new set of videos. This is Dalton again, post operation. Red dots appear amid green on the screen. Dalton picks them right out. Lick. Click. Juice. Again: different red dots amid different colors. Lick, click, juice. Dalton is unstoppable. He gets almost all of them, one after the other. A monkey with genetically engineered eyes isn’t even the most striking thing about the Neitzes work here. It’s what Dalton says about the genetics of color vision. Most mammals are dichromats—they have only two photoreceptors for color. But some primates, including humans, are trichromatic. How and why that ability evolved remains something of a mystery, but being able to induce it in a dichromat like Dalton says a lot about color vision. It also says a lot about how the brain deals with color. Oh, and it might be a cure for red-green colorblindness in people, too. Becoming his own research subject, Dalton started experimenting. Most people, he realized, see six colors in the Newtonian spectrum “I see only two or at most three distinctions,” Dalton wrote. Red, orange, yellow, and green were all “yellow” to him. Everything else was blue. Colors looked different under candle-light than daylight. Dalton the man, like Dalton the monkey, was a protanope. Even today the condition is sometimes called Daltonism. (It affects about 1 percent of human men and a far smaller fraction of women; the more common form of red-green colorblindness, a mutation called “deuteranopia” in the cone that senses greenish, medium-wavelength light is a little more common—like 6 percent of men.) The implication of all those likewise-envisioned brothers was that Daltonism somehow ran in families—though Darwin’s Origin of Species and the concept of evolution were still six decades in the future. Was color something that surfaces absorbed or reflected? Was light made of teeny-tiny particles (as Newton had said) or waves? And if it was waves, what medium did they travel through? As the art historian Melissa Katz has written, over the next 100 years, the palate of available industrial pigments would double—a long journey from paleolithic reds and yellows and classical blues and greens to the colorized, modern world, to chrome yellow, iodine scarlet, zinc white, cadmium yellow, manganese violet. And yet, even as a wild array of new colors proliferated, there was no single, agreed-upon theoretical construct explaining how people’s eyes drank them all in. In fact there were two. In 1801 the genius polymath Thomas Young determined that not only was light composed of waves (traveling in a “luminiferous ether” that wasn’t actually a thing, but stick with him). Using calculations from Newton himself and a pretty good estimate for the speed of light, Young was able to quantify the wavelength of different colors. Red, he said, was “482 millions of millions of undulations in a second.” Green was 584 millions of millions. As the vision researcher John Mollon notes in Normal and Defective Colour Vision, if you convert these measurements to nanometers, they’re damn close to modern values. Young didn’t stop there. Wavelength is in effect a continuous metric with an infinite number of possible colors; estimates for the number of colors humans see have ranged from 2 million to upward of a billion. But “as it is almost impossible to conceive each sensitive point of the retina to contain an infinite number of particles, each capable of vibrating in unison with every possible undulation, it becomes necessary to suppose the number limited, for instance, to the three principal colours, red, yellow, and blue,” Young said. In 1852 Hermann Ludwig Ferdinand von Helmholtz published a paper on color vision that made the distinction between the mixing of pigments—stir red and green paint together and you get yellow—and the mixing of light. Pick the right colored lights, complements of one another, and mix them together, and you’d get white. Hemholtz was originally skeptical of Young’s approach, in part because when he mixed other colored lights together, the results were desaturated, like pastels. By coming up with a way to quantify people’s perceptions of colors, James Clerk Maxwell—who’d go on to write the equations that still define electromagnetism—brought Helmholtz around. Maxwell realized that every perception of color affected, to a greater or lesser extent, all three of the sensations that Young had postulated. Nobody ever saw a real, hypersaturated spectral hue. But to prove that there could be colors outside a person’s fundamental ability to see them, Maxwell realized he’d need to quantify the color observations of people who didn’t have one of Young’s sensations. In other words, he needed people who were colorblind. Maxwell developed a theoretical colorspace, a triangle with red, green, and blue at the vertices. He’d learned to generate an equation for any possible color in that space using spinning disks and colored paper; working with colorblind people he found that for any color, all the other colors they confused with it were on a line from that color to the red corner of the triangle. Hence, the person was missing the red receptor, or as Maxwell described him, a dichromat. The fundamental sensation of red was outside that person’s triangle. I promised you two theories, though. An adherent of a more spiritualist, mystical German scientific tradition, Ewald Hering, a scholarship kid from Saxony, had been fighting with Helmholtz since Hering got his MD from the University of Leipzig in 1860. (I’m particularly indebted to R. Steven Turner’s book In the Eye’s Mind: Vision and the Helmholtz-Hering Controversy for much of this history.) Hering wondered: Why can a person imagine a green that is bluish or yellowish, but not reddish? Or a blue that is reddish or greenish, but not yellowish? If you decide that red, green, blue, and yellow are the four fundamental colors—urfarben, Hering called them, though today scientists say “unique hues”—then why can’t people see, or even conceive of, red-green and blue-yellow? The colors were opponent, or antagonistic. German has a word for it! They’re gegenfarben. And the idea that just three sensors can account for all the colors? “One is then forced to describe yellow, for instance, as a red green or a green red, blue as a violet green or green violet,” Hering wrote in Outlines of a Theory of the Light Sense. No big deal in and of itself, but “such a way of assigning names to colors does not at all express in what way and to what extent the colors appear to be interrelated.” In other words, the three-colored triangular colorspace just isn’t how people see. Hering re-drew the colorspace according to his opponency theory, a circle with red opposite green and blue opposite yellow. Where red overlaps blue, you get various purples; those oppose the chartreuses where yellow overlaps green. Red-green colorblindness was, to Hering, a lack of ability to perceive the red-green opponency axis. Trying to figure out how the more phenomenological, observational experience of color meshed with what people knew about how the eye worked (or sometimes didn’t work) consumed the second half of the 20th century’s vision research. The Neitz lab takes up nearly two full floors of a building in Seattle’s South Lake Union neighborhood, which used to be known for houseboats and nightclubs with a casual attitude toward the age of their patrons. Today it’s home to a dizzying number of cleanly modern near-cubes—University of Washington research labs, Google’s Seattle HQ, more Amazon offices, and businesses with headscratchingly sci-fi sounding names like “NanoString.” A new Facebook HQ under construction next door to the Allen Institute. It feels like a lot of stuff in this part of town uses blockchains for something. In small rooms off the lab’s various hallways, the advanced instruments of vision research spread out like stand-up games at a really difficult arcade. Neitz, a lean, smiling man in a Pacific Northwest standard-issue fleece pullover and nice track shoes, shows me one of the newest gadgets: a scanning electron microscope with an automated microtome inside, the science version of a deli meat slicer. The Neitzes got married in 1981 and got their PhDs in 1986. Back when they were grad students, Maureen was working on genetics, and Jay was doing neuroscience. He realized that color and colorblindness were a kind of natural experiment on consciousness; Maureen thought molecular genetics might help figure it out. When they got their PhDs, they decided to work on it together. His office is downstairs and hers is upstairs. “Our ability to work together has—” he begins. The primate eye has four light-sensing photopigments in the retina, at the back. There’s rhodopsin, found not in the “cones” that perceive color but other cells called rods, used in low-light conditions. In the cones are three other types—one sensitive to longer wavelengths for reds, one to the middle-wavelength one for greens, and one to the short-wavelength for blues. It’s the Young-Helmholtz theory made flesh. But where the theory is willing, that flesh is weak. So-called Old World primates—macaques, baboons, people—generally have trichromatic vision. New World primates like squirrel monkeys, though, are weird. Some squirrel monkeys are trichromats and some are dichromats—but not all the trichromats see colors the same. Some are “anomalous trichromats,” a common form of colorblindness. It’s the photopigments’ fault, somehow. Early on, Neitz’s mentor Gerald Jacobs learned that squirrel monkeys have five. There’s short, medium, and long, but also one halfway between red and green. Some have only the red and the halfway pigments. They’re deuteranomalous. Some have the green and the halfway pigments. They’re protanomalous. And some protanopes have only the green. The males are all dichromats. Some of the females are trichromats. The Neitzes went to work on the basic mechanism for how those photoreceptors functions, and it’s a doozy. A photopigment has two main parts—the “opsin” is a relatively giant protein that threads through the membrane of the retinal cell like a pile of overcooked rotini pasta. At the heart of that complex, no matter what color it senses, is a wee little molecule called a chromophore. This particular one, 11-cis-retinal, is a chain of carbons with a dogleg bend at one double-bond along its backbone. As a class, this system is called a G-coupled protein receptor—a sensor on the outside of cell connected to machinery on the inside. Some trigger hits the sensor and starts a cascade of action that activates a “g protein” in the cell, setting off some rubegoldbergian chain of biological activity like the release of a neurotransmitter. When a photon hits the chromophore’s dogleg double bond, one of those bonds breaks. Half of the molecule rotates. The chromophore literally changes shape, straightening out. “And that straightening-out pushes on the opsin it’s sitting inside,” says Greg Horwitz, a neuroscientist at the University of Washington. “When it straightens out, it pushes against the opsin protein a little bit, and the protein changes shape, so that now it can interact with the g-protein.” The rubegoldberg mechanism starts to crank; there’s a change in voltage across the cell’s membrane, and that’s the first step of vision. Higher wavelength colors, toward red, have lower energy. “The protein puts pressure on that double bond, twisting it,” says Neitz. “If it’s twisting in the right direction, it takes less energy from a photon to break it and remake it.” More mechanical energy from the protein means it takes less energy from the light to trigger the response—a longer wavelength. And vice versa. As soon as the cells at the back of the eye transduce the photons that came streaming in through the iris, there’s no “color” anymore. Once the chromophore has absorbed its photon and the opsin around it has determined whether it’ll sproing straight or not, the actual wavelength doesn’t matter anymore. Technically, that’s called “univariance,” and it means that different things can set off the same cone. The wavelength of light might be closer to the peak sensitivity, or there might be more light overall, or both. So the simple pinging of a cone doesn’t signify a color. How could it? If the system was that direct, you’d only be able to see red, green, blue, or overall-bright—but not yellow. There’s no single receptor for that. Maureen grew up in Sunnyvale, just up the road from Palo Alto and the Stanford lab where Jeremy Nathans worked. They’d met in grad school; Nathans had told them he was working on sequencing the genes responsible for making those opsins. So on a visit back to see Maureen’s family, the Neitzes stopped in to see Nathans. And he’d done it. The team had the genes for the L, M, and S opsins—Nathans’ genes, actually. They’d sequenced his. So with all that in mind: Could what the Neitzes did to Dalton work in a human eye. Could you cure a red-green colorblind human male? It’s not an easy question. Gene therapy is tricky; most things that go right and wrong in people’s bodies and minds don’t come down to just one gene, and even when they do, it’s not always obvious how to tweak that gene to fix the problem, or what the knock-on effects of that tweak will be. For now, the Neitzes are working on a modification of the treatment. Instead of having to cause a retinal detachment, they’d like to be able to get the right amount of transduction with an injection into the vitreous, the clear jelly that fills the eyeball. So they’ve made the right modifications to the vector and the procedure, and they’ve injected monkeys. “We don’t know the results yet,” Neitz says. So, sure, Dalton the monkey is behaviorally trichromatic. He acts like he sees colors the way you (if you’re color-normal) and I (I’m color-normal) do. But is Dalton actually trichromatic? For full-blown trichromacy, you’d have to have the right wiring between the cells of the retina and in the brain. Neitz argues that his monkeys do, that it was already laid down and waiting to receive the new input from his engineering. After all, some of female squirrel monkeys are naturally trichromatic. Other neural architectures could give the same results as Neitz has seen. The retina is a complex layering of ganglion cells, bipolar cells, amacrine cells, and the horizontal cells that wire the rods and cones together; clusters of cells make “receptive fields” that feed information to neurons up the line, toward the brain. The perceptions of light and color are actually combinations of responses and signals from all those things, an arithmetic of negative response from some and positive response from others. It’s way more labyrinthine than just red light pinging a red photoreceptor so you see red. “You can get the whole population of responses just by nonselectively firing a ganglion cell with every photoreceptor in its receptive field,” Zaidi says. People argue about the evolutionary value of color overall, but it must have one, or we wouldn’t be able to see it. So how’d we animals get it? To evolve trichromatic vision, you need a brain that can process input from a retinal mosaic of three photoreceptors. But to get any selective advantage from having that brain, you need three photoreceptors and all their neural wiring. The monkeys have all three photoreceptors. Their cones respond to red light. That’s a threshold, yes. But, I say, trying for delicacy, did the Neitzes every try just dissecting one of their monkeys’ eyes and looking at the cones? It’s enough to suggest that the science has more questions to answer. So, too, might the ethics. Four or five phase I and phase II trials of gene therapy for human color vision deficiencies seem to be underway right now, but they’re all for a much more severe form, achromatopsia—the total lack of functioning cone receptors. People with the disorder don’t see color, and also see less detail and are painfully sensitive to light. Researchers have also had more success curing it in other mammals, including dogs and sheep. So the disease is more debilitating than red-green colorblindness, and the research track record is better. The next step, experimentally, is getting the treatment to work, and show it doesn’t have side effects. The approach to the Food and Drug Administration might involve treating another kind of colorblindness, blue-cone monochromats missing both the red and green cones. It’s a more serious impairment, of both color and acuity. It’d be cool to watch a show on that monitor. After all, if you think the quantitative assessment of whether a monkey has acquired metamonkey vision is hard, imagine trying to ask what colors the monkey actually sees. Scientists barely know how to do that with other humans, and humans can speak English. That’s what you learn when you study people’s color vision. “It’s like, ‘oh, you aren’t seeing the same things as I am. You’re just using the same words,'” Maureen Neitz says. 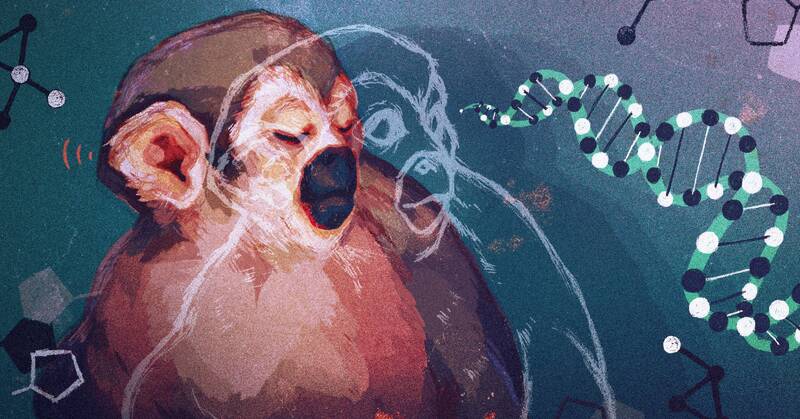 So I ask, tested abilities aside, do the post-gene therapy monkeys act different? Does seeing colors change how they are? There is one thing, Neitz says. Outside his office is an old coin-op gum-ball machine, the kind with a glass sphere and a dispenser with a crank. This one’s filled with loose M&Ms; I had noticed it on the way in because it contained only red, blue, and just a few green, and I’d asked if that reflected the distribution of cones in the retina. Alas, it was just that green ones were more expensive on Amazon.